With ClassDojo, we’re finally able to do the work that inspired us to become teachers in the first place. We have BIG dreams for our students and ourselves. And for the first time, I feel like I’m making them happen. To bring communities together and give them the tools, ideas, and energy to improve education for all kids. At ClassDojo, we want to transform education for every kid in the world. To do this – and do it soon – we have a simple plan: connect teachers, parents, and students in every classroom, and work with them every day to bring the best ideas into their classrooms. It's not about creating an “ideal” classroom, a one-size-fits-all model that everyone must fit, because there's no such thing. Instead, we believe that teachers, parents and students should have the power to create an incredible classroom that is best for them. And, we believe that when you give good people simple ways to do the right things, amazing things will happen. That's how we believe we can transform education. Together. By helping every teacher, parent, and student in the world create an incredible classroom all their own. 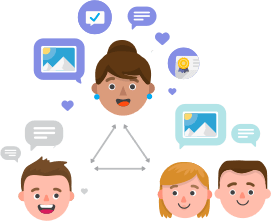 ClassDojo is a school communication platform that teachers, students, and families use every day to build close-knit communities by sharing what’s being learned in the classroom home through photos, videos, and messages. ClassDojo is so cool! There are so many things we learn and do at school that we wish our parents could see, and now they can! Teachers, students and our parents all work together to make our time in school worth every minute. Teachers translate 270,000 messages every week in the U.S.
ClassDojo has made me feel more connected to my daughter’s classroom than ever before. I really feel like her teacher and I are part of a team! Classroom is where teachers and students build their classroom culture. They choose skills and values – things like creativity or teamwork – and share feedback on progress with each other. Classroom is the simplest way for teachers and students to build an incredible classroom culture together. Messages allow teachers, parents, and school leaders to instantly message each other, without needing to share phone numbers or contact details. Messages can be translated into 35 different languages, and "Quiet Hours" lets teachers set away times so parents know when they are not available. Stories are instantly updating streams of pictures and videos from the school day. Every class, school, and student has their own Story, all of which are shared home with parents. School Story helps school leaders to share with all families connected to their school, Class Story helps teachers to share with all families connected to their class, and Student Stories helps students to create their own story: a timeline – or portfolio – of what they've learned. 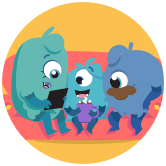 ClassDojo Big Ideas gives teachers and parents simple ways to access original content that helps students learn about important concepts and social-emotional skills. The original video series ‘Growth Mindset' (made in partnership with Stanford PERTS) and ‘Empathy’ (made in partnership with Harvard’s Making Caring Common), have been seen by 1 in 3 kids aged 5-14 in the US. 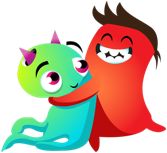 ClassDojo Beyond School is an amazing way for families to bring the best of ClassDojo home. Families can subscribe to get access to feedback points at home, a fun avatar customizer, and character-building activities to help kids develop skills like perseverance and mindfulness. It’s completely optional, and currently being rolled out to ClassDojo families! Ready to create incredible classrooms? ClassDojo’s culture values empathy, long-term speed, ownership, continuous improvement and creativity. We welcome talented, driven people who care about improving education. We’re doing that today by changing how classrooms work, at scale. If this sounds exciting, we’d love to hear from you.